Beautyfix 3 - the Summer 2009 Edition is here! I can't believe it is July 1st. I mean, this first half of this year has flown by, hasn't it? One thing that has kept me busy so far this year is my involvement as a panelist on Beautyfix. I am so proud and lucky to be one of the "experts" in the know that actually help to select the products to be in each quarterly edition. 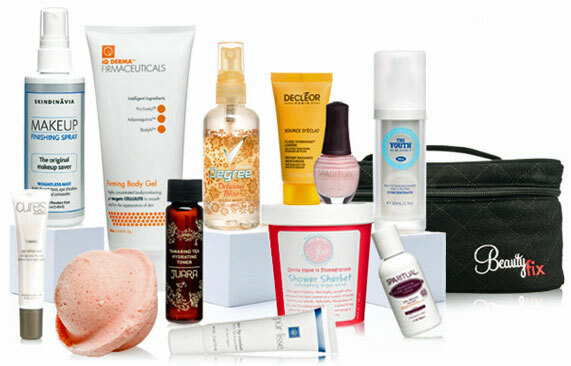 This edition, the Summer 2009 Edition also known as Beautyfix 3 is the best yet. Can you imagine - all of those products inside that great Beautyfix bag? For $49.99? Believe it, beauties. It is pretty awesome looking isn't it? Skindinavia Makeup Finishing Spray - FULL SIZE 2 oz. pur~lisse pur~lip comfort - FULL SIZE .5 oz. Degree Women Body Mist - FULL SIZE 3 oz. Decleor Instant Radiance Moisturizer - TRAVEL SIZE .5 oz. Spa Ritual Nail Lacquer (one of two colors) - FULL SIZE .5 oz. Spa Ritual Instinctual Moisturizing Lotion - TRAVEL SIZE 1.7 oz. me! Bath Shower Sherbet - FULL SIZE 16 oz. Juara Tamarand Tea Toner - TRAVEL SIZE 1.1 oz. Bliss The Youth As We Know It Concentrate - FULL SIZE 1 oz. iQ Derma Firmeceuticals Body Firming Gel - FULL SIZE 6.75 oz. 12 products in all? 9 of them being full size? I can't even begin to comprehend the value here. Seriously, just look at the price of a few of the products alone. The Bliss Concentrate sells normally for $70. The Skindinavia Finishing Spray retails for $29. The pur~lisse lip balm is regularly $22. The Cures by Avance Eye Cream retails for $50. I could go on, but I really don't think I need to. These products in Beautyfix3 are worth over $325! Membership is limited each quarter, so get in early ladies. To learn more and order, visit Beautyfix.com. Stay tuned for individual product reviews coming up over the next few weeks too. You will love this latest edition - I just know it!